That’s the end of stuff I’ve copied over from the LGP blog. The rest will be new code and new ideas. This entry was posted in Comments on December 17, 2014 by michael. Sometimes, you may write functions in C that do things in the same way as printf, using stdargs. This function isn’t rocket science, it just simply appends your string into a file. It is a simple time saver utility. And gcc will say ’sure, no problem’. But running the code will always crash. It tries to interpret the integer as a string. This is the kind of thing that should be picked up on by the compiler. And in fact it can be, quite easily. This tells gcc to treat the parameters 1 and 2 as the parameters to printf (which it knows how to check for errors). It will then check parameter 1 (the format string) against what is passed in starting at parameter 2 (the …). If an incorrect data type is used, this will now be detected and flagged up as a warning, in exactly the same way as an incorrect type used in a printf. This entry was posted in Programming and tagged C, compiler, gcc, LGP, printf, stdargs, warnings on December 17, 2014 by michael. Todays technical article is going to go into a couple of issues that we have run across porting from Visual C++ to g++. I will say right now that I am an application developer, I don’t know the fine details of how the inner workings of the compilers work, so some of this is merely an educated guess as to WHY the problem happens, but the effect and solution is correct. Now, I don’t know about you, but I find that error message singularly unhelpful. It took some time to run this one down the first time. It seems that g++ and VC++ perform some symbol resolution in different passes to each other. Because what this message is saying is that ‘at line 172, you have tried to use __forceinline, or something you reference has a member function that has __forceinline in it, but I do not know what the thing is, so I cannot inline it’. The second issue I thought I would raise today is one that actually happens quite commonly on porting from Windows to Linux. This is the case of bad memory management. On Windows, the way memory is allocated allows for a certain sloppiness in code. While HIGHLY unrecommended, this is the sort of thing that happens in Windows code all the time. The following is a highly simplified example of the problem. Now, as you can see here, the application uses the variable str right after it has been free()’d. On Windows it seems that this kind of thing can be gotten away with. The memory manager on Windows is highly unlikely to either assign this memory address somewhere else, or to mark it as unavailable. On Linux however, you will often find that this kind of code leads immediately to a segmentation fault. 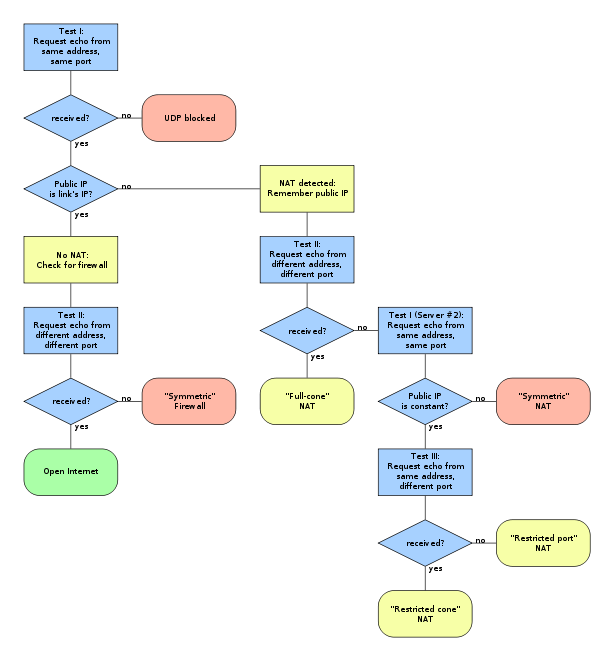 The example above is highly simplified, but illustrates what some of the more complex segmentation faults we have seen boil down to. If you see an error like this, which works on Windows and not on Linux, check your order of accessing. I know it sounds obvious, but it happens so often in commercial code that I feel it is worth stressing – free memory only when you have REALLY finished with it. This entry was posted in Programming and tagged C, compiler, forceinline, free, g++, inline, LGP, malloc, memory, visual c++ on December 17, 2014 by michael. It is a bit of an arcane artform, making a game that runs on all Linux versions. We do quite well at LGP but there is always room for improvement. Recently, we came across an issue with PulseAudio (I will rant about Pulse in some other post). It became almost impossible, due to the architecture of alsa, and the combination of our build environment, and our higher level sound libraries, to make sound work – pretty much at all, in Linux games. Those of you with older games will know that for a while they all stopped having sound. Some of them we still haven’t released patches for yet (they will be forthcoming). Now, one of the big problems was that sound libraries (such as OpenAL or SDL) go through their own motions of opening sound. We have no way of directly controlling what they do or how they do it. This is a common feature with many libraries, they will load their own dependencies in a way we cannot control. The biggest problem is that OpenAL and SDL try to dlopen libasound, and on some machines, libasound doesn’t work with our binaries. On others, it can actually crash the whole game due to incompatibilities. This is a common issue when dealing with unknown system configurations when sending out a binary-only product into the world. You never know just what peoples systems will have installed, and just how they may confuse the situation. But you cannot just say ‘well, bad luck, it crashes on your machine’, people will be understandably upset. We came up with a rather horrible system to make this work, and one that I hope may be of use to those of you who come here for our technical insights. This system is deliberately designed to work with libraries that have the potential to actually crash a program. As a simple example that many here will follow, I am using SDL’s audio system as the target, and using it to test whether ALSA works or crashes the program. At this point you know whether the system asound (ALSA) library is safe to use. This is a truly truly horrible system, when you actually have to allow an application to crash, you know something is wrong, but sometimes there is no option. As a technical note, note the use of _exit() instead of exit(). This ensures that when the program ends, no atexit() functions are called. Using exit() could mean things like SDL’s cleanup being called, or who knows what else! Signal handlers should be removed at the point in the code indicated. They interfere with the proper signaled exit of the program and will prevent WIFEXITED from detecting a crash properly. Bear in mind the signal removing only happens in the child process and will not affect signals in the parent. So, what can you do knowing that the system works or doesn’t work? Well, knowing that it works, you can simply run the initialisation as it stands and enjoy the working library. If you know it fails, you can either skip this system altogether (in this case run without sound) or you can switch to another library. If you setenv an LD_LIBRARY_PATH this will influence the path that dlopen looks for libraries. LD_LIBRARY_PATH is searched before any other directories, and so will override the default location of the library. This means, in this instance, that SDL_InitSubSystem will dlopen the libasound.so in the location you have set the LD_LIBRARY_PATH to. I hope this will relieve some headaches for some developers out there. It is always difficult making any application when you do not know what the target system will have installed on it. Of course, we can always say ’sorry, you need a specific version of this or that library’ but when you have just bought a game, that is the last thing you want to hear, and so – we have to jump through some hoops to stop that happening. This entry was posted in Programming and tagged ALSA, C, crash, fork, LGP, libraries, openAL, PulseAudio, SDL, sound, _exit on December 17, 2014 by michael. This is a technical article that goes to some depth into networking protocols. Reading this article, you will need some overall knowledge of how UDP networking works, and a basic idea about what NAT and IP MASQ is. We’ve just spent quite a while investigating issues with a small number of games failing to make connections to perfectly good servers. Grapple, the LGP networking layer, is designed to work around the presence of firewalls, NAT, and all that good stuff, so that users can host a game from any machine on their network, whether it be exposed to the outside world or not. So, when we found out that some people couldn’t connect to games, we were a bit concerned. After all, our code should be just fine for this. It has worked in all of our test scenarios. Unfortunately we assumed that all networking at the kernel level worked. This was a mistake. So, take a scenario, lets say host A (lets call it gateway) is the gateway server, running IP MASQ to NAT all servers on its local network. Host B (call it laptop) is a machine on the internal network. Now, as we run through this article I will run you through some aspects of NAT, STUN, TURN, and other nice things about firewall and NAT handling. I wont be going through the exact protocols, but I’ll give you a bit of an idea how it works. So, Laptop is the machine I want to use to start up a game server. I start a server and bind a UDP socket to port 2000 on all interfaces. I then use STUN to find out what kind of connection I am on. The method for STUN is shown below. STUN tells me that the server is on a symmetric NAT. This means that the only things that can communicate with the server, are things that the server has talked to itself first. This is the most restrictive type of NAT, under usual circumstances it will mean that it is effectively impossible to make connections to this laptop game server without making manual traffic routes through your NAT routing table on the gateway machine for each client. Any client connecting to the server will try and connect to the laptop, but any routing will be rejected because the laptop has not first connected to the client. However, Grapple can handle this, as I will demonstrate. So, on the gateway machine (it is important for later on to note that the gateway machine is also the client trying to connect to the laptop server to play the game), I start up a client. The client tries to directly connect to the server, sending a number of UDP connection requests. The server does not receive them. This is not unexpected, as demonstrated earlier, the server is behind a symmetric NAT and the server hasn’t sent any data to the client, and so the servers routing will reject anything being sent to it from the client. So, at this point it looks fairly hopeless, how can the server magically know the client is connecting to it. Well, the answer lies in the STUN server. 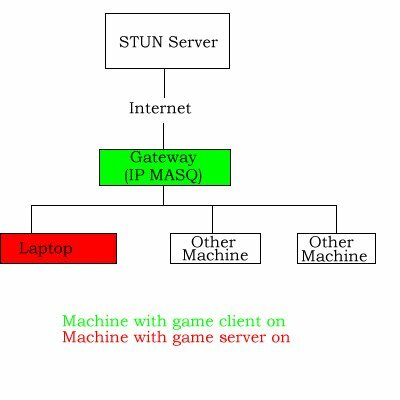 The laptop server has already talked to the STUN server and so the NAT routing tables allow the STUN server to send more data to the laptop. So, the client gateway knows about the same STUN server, and so sends a request to the STUN server to ask the laptop server to connect to it. The laptop receives this request, and connects to the address that the STUN server requests. The client should then, we hope, be able to communicate. Now at this point this can go two ways. In this case, the client receives the data packet, and communication can start. We’re pretty much done handshaking, the client and server can talk to each other. The client will never receive the packet from the server. No communication is possible. Now, in the instance in question, we discover the situation is an impossible one. The client receives the packet from the server, but then is unable to reply. This is completely impossible, the routing table to the client has seen a packet to from the laptop to the gateway, and so should allow 2 way communication between the two machines (on the same ports). But for some reason – it wasn’t! This was the sticking point. How could this be possible. We knew that the laptop worked this way because we had communicated with the STUN server successfully, and this relies on the fact that an outbound packet creates a tunnel back to the server. This is vitally important for all networking, or you would just send out data and never get anything back, rendering NAT pretty much useless. The issue turned out to be the IP MASQ NAT on the gateway. The laptop sent a packet to the external IP address of the client. This means that it should have gone out to the NAT layer, and been NAT’d to the external IP and port of the server socket communicating to the client. The client would have received a request that external IP 123.123.123.123 was trying to talk, and would respond to that address. The response would have gone through the same IP MASQ layer, and the server would get back a response from the location it expected. IP MASQ has decided in its infinite wisdom to take a short cut. It spots a packet will be routed to the gateway, and decides that, hey, they are on the same internal network. They can talk directly! And so, the packet presented to the client is not showing as coming from the outside internet, it is shown as coming from 10.2.2.13 (the internal IP address of the laptop). And so, when it gets this reply, it sends a response back. As the response never passes through the IP MASQ because it is going over the internal network, then the response to the server comes from 10.2.1.1 and as the server sent its data to 123.123.123.123 the servers own firewall (independent of the NAT) says ‘hey, I don’t know you’ and rejects the packet. All because IP MASQ takes a short cut. In the end, the problem is solved that if the client doesn’t receive further communication from the server, then it falls back to its final communication option, TURN. We have already demonstrated that the STUN server can talk to both sides, as both sides initiated communication with the server. This means that the STUN server can act as a relay between the client and the server, sending any and all data via this third party. However to be honest, we don’t like doing that as obviously it will increase latency of games, and also it means that any and all game traffic that has to resort to TURN has to be passed via our servers. A few games running at once, no problem, but more and more games means more and more bandwidth used, and we’d like to avoid that! So in the end, the problem is solved, but really, if not for IP MASQ making a shortcut for efficiency, there would never have been a problem in the first place. This entry was posted in Programming and tagged firewall, Grapple, IP MASQ, kernel, LGP, NAT, UDP on December 17, 2014 by michael. Something that came up in porting X2 and X3 is that Visual Studio in Windows handles variable length macros, and as far as we could see, GCC didnt. which then works with single and multiple values in macros, x becomes the fmt AND the … for the mydebug . This entry was posted in Programming and tagged C, gcc, LGP, macro, visual studio on December 17, 2014 by michael. OK, so this little programming post is nothing like rocket science, it really isn’t. It is, however, REALLY useful, and something that almost nobody knows about the C language. We came across it when we were porting a game a few years ago, and none of us had ever seen it before. We tried it, and it works! Fairly standard, nothing too unusual here. However there is another way to do it! Unfortunately, it doesn’t seem to work on anything other than C/C++, which is a shame! This entry was posted in Programming and tagged C, LGP, switch on December 17, 2014 by michael. This nice little method is one we used for PenguinPlay. If you have a whole load of data, lets say a hierarchy of categories with items in them, like in an online store, it is common to store this data in a tree. This allows you to move up and down the tree logically to access the data in the same way it is visualised. Now to find all categories that are children of Linux, how do you do this? Well, most of the time, the simplest way to write some code for this will find all of the categories that are children of Linux (5,6) and then for each of these find all of the children of these (7,8) and so on and so forth down the hierarchy. This isn’t too inefficient in smaller trees, but imagine having ten levels, each with five branches at each level. You very quickly get an impossible number of items to deal with using this method. So, how do we do this efficiently? As you can see, if you look at it, the layout above shows the exact same data that is shown in the first tree, just displayed differently. Now, lets add in category 3 and 4, in each case, we insert the categories with min and max values that are inside of the parents, and not overlapping with any other children of that parent. Like so. Simple enough, but what does that get us? Not a lot yet. Lets go a bit further down the tree, and add some children to the Linux category, and see what happens. So, using the same rule, any child we add must have a min and max inside its parents, and its parent must expand to accommodate it. Lets add (5)strategy in as a child of Linux. OK, so there we have it, we have a tree, showing a hierarchy, and all of the categories have numbers for a min and a max value. All numbers are unique, and all numbers belonging to a child are inside the scope of their parents. Great, but how does this help us? Simple. In a single pass through a flat list of categories, you obtain a full list of all children. No matter how deep the tree system goes, as long as you keep to the rules of calculating the min and max values, this will always work. It also works the other way. If say, you want a list of all parents of the RPG category (min=10,max=11), simply look for all categories whose min is less than 10 and whose max is more than 11, and you get the entire ancestry of that category. All in one pass. This all comes in especially useful if you combine it with SQL. Complete tree segments can be obtained from a single efficient SQL query. Queries are easy to generate that can find, using the above tree as an example, all Linux games of any category! This entry was posted in Programming and tagged algorithm, LGP, sorting, tree on December 17, 2014 by michael.